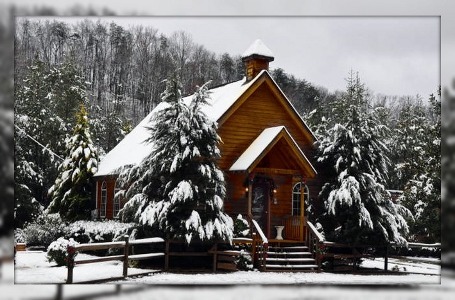 Our beautiful wedding chapel is located in a private mountain setting just minutes to Dollywood and the Action-packed attractions of Pigeon Forge, Gatlinburg, Sevierville and the Great Smoky Mountains National Park. Enjoy a nice simple reception with nuts, mints and punch or have that dream reception offering a complete dinner, music and DJ. Let us help you plan the perfect Wedding Reception. Relax in a Romantic Honeymoon Cabin or Chalet nestled in the Heart of the Smokies. Amenities include (but not limited to): Heart Shaped Whirlpool Tubs, Hot tubs, Fireplaces and Awesome Mountain views. We would also be happy to assist your family and guests with their lodging accommodations. We offer Vacation and Honeymoon Chalets and Cabins located in Gatlinburg, Pigeon Forge, Wears Valley & Dollywood area. Call In the Smokies Weddings today! We’re here to create a spectacular memory for you. Look through our “wish list” of ideas and ” packages ” then let us customize your wedding plans or vow renewal. Or give us free rein to plan a intimate ceremony in front of a magnificent waterfall somewhere in the Great Smoky Mountains or in the world famous Cades Cove. To be married in Tennessee you must obtain a Tennessee marriage license. Your license can be acquired at any Tennessee Court House. There is no blood tests or waiting period required. May your future wedding day be joyously blessed.